It is a dream… of what has never been… true, it has never been, and therefore, since the world is alive, and moving yet, my hope is the greater that it one day will be… dreams have before now come about of things so good… we scarcely think of them more than the daylight, though once people had to live without them, without even the hope of them. Right now (June-September 2015), there is an exhibition of the work of William Morris and his contemporaries at Compton Verney, an art gallery very close to where I live in Warwick, a place I love visiting. 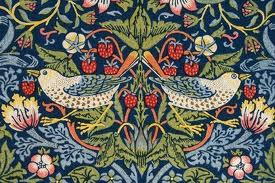 I love William Morris designs (as you’ll see from a former post on this blog) and have just bought a tapestry shoulder-bag with the Strawberry Thief design on it.. True, art and design in our lives often has a monetary value; this seems to be the nature of human life. But to me, William Morris’s dream of everyone having his or her “share of the best” is the ultimate democracy, the democracy of ‘value’ and quality of life, above all else, whatever our circumstances. As we know this dream is very far from being realised in our world. But how inspiring William Morris’s words are, and how encouraging his vision, for those of us who dream, and have high ideals.